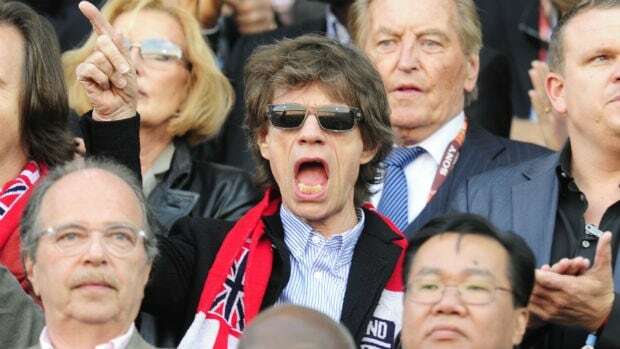 Mick Jagger has had a run of unwitting World Cup predictions as good as any octopus—only Mick's endorsement is to be avoided at all costs. Anyone he supports, loses. He was in Brazil's corner today, naturally. Jagger's performance at the 2010 World Cup was legendary. He sat in a box with Bill Clinton for USA-Ghana, only to see the U.S. lose 2-1. The next day he attended England-Germany, wearing an England scarf; England lost. He capped it off by watching Brazil-Netherland in the quarterfinal, alongside his son clad in a Brazil shirt. The Dutch won. He picked Argentina to win it all days before they were knocked out by Germany 4-0. So far this year, Jagger has stayed away from matches, but his influence has been felt. At a show in Lisbon in May, he tapped Portugal as his tournament favorite and England as runners-up; neither made it past the group stage. After the tournament's start, he predicted, in turn, England and Italy wins over Uruguay; Uruguay won both, and England and Italy missed out on the knockout round. So it's no surprise that Brazilian fans had begged Jagger and his pe frio—"cold foot"—to stay away from the Seleção. One fan even showed up to today's match with a cardboard cutout of Mick in a Germany kit. Alas. 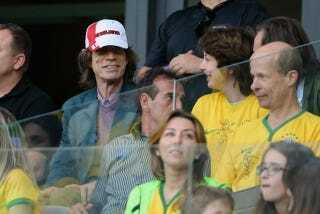 Jagger did attend today's match, his son again wearing a Brazil shirt. You know how that went. The England hat wasn't enough to un-mush things. 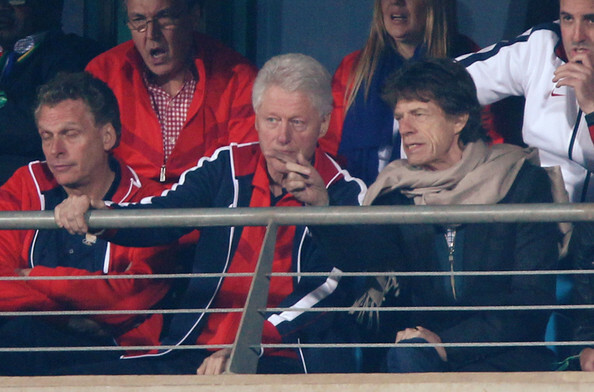 Mick Jagger is bigger than the game.